The WRAP-IT-HEAT® Series TRX Drum Heater thermostatically controlled drum heater with a three heat selector switch. Model TRX Drum Heaters are for all metal drums. Acra Series TRX is designed for heating materials with GOOD HEAT RECEPTIVITY. Thermostat bulb senses temperature in an area remote from the active heating element. You have the choice of two thermostat ranges: High, 200°F - 400°F, and Low, 60°F - 250°F. 120V and 240V rating available. Three heat switch allow three wattage ratings per thermostat setting and voltage rating: HIGH, Maximum Watts; MEDIUM, 1/2" Maximum Watts and LOW, 1/4 Maximum Watts. Equipped with spring loaded toggle clamp for snug fit, 6 foot power cord and a special, electrically grounded, three pin plug. 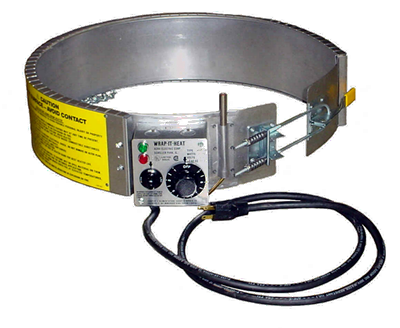 The WRAP-IT-HEAT® Model TRX-55 Drum Heater is U.L. Listed and C.S.A. Certified.